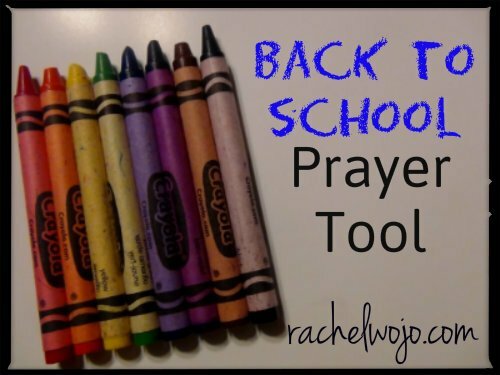 “The Back to School Prayer Tool uses the basic eight colors in a crayon box to focus prayer thoughts for the school season. Pray for safety of all in the school day. Whether you teach your children in a homeschool setting or send them to private school or they attend public school, safety and protection from the Lord is needed. You could also use red to remember any “warning” areas you want to remember for your specific child. For bullying issues. For peer pressure problems, etc. Pray for social communication and attitudes. Children encounter all types of personalities from the crosswalk guard to the bus driver. No matter the school setting, attitudes can make or break the day. Pray for the intellectual and emotional stability of your child. Learning is difficult if you can’t focus or don’t feel well mentally. Pray for your child to remember that God is always with them and never leaves them. Pray for your child to feel the strength of God in them throughout the day as they study and learn. Pray for your child’s growth- that the school year would be a steady stream of growth throughout the year. That God would keep their learning atmosphere balanced in order to promote growth. Ask God to give your child a sense of peace no matter where they are in their day. That their spirit would feel free and loved in Him and that peace would radiate to others. That their environments would be peaceful and conducive to learning. Thank God for your child’s imagination and ask Him to use people to channel that creativity. Ask Him to bless your child’s mind and talents and believe that He will funnel your child into the exact fields of expertise and education in which they should be. Ask for God to bless your child’s teachers with creative ways and imaginative hearts. Brown is a down-to-earth color and often signifies work. Ask God to give your child a strong work ethic as you work to model and instill character. Pray that everyone involved in caring for your child or teaching your child would be a hard worker- whether others or yourself. Pray for God to keep your child from becoming confused or insecure. Ask the Lord to keep your mind clear as a homeschool parent when you teach. Pray for your child’s teachers and administration that God would guide them towards wise choices in the classroom and provide clarity for focusing on their positions. Pray for the Lord to reign because He is not a god of confusion.